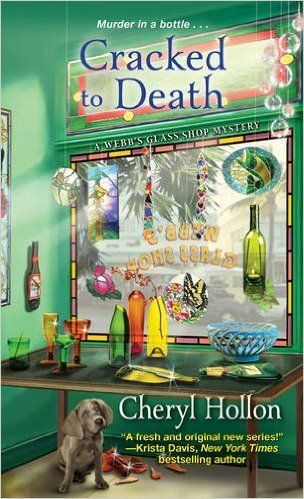 Cheryl Hollon visits my page today to talk about her new cozy mystery, Cracked to Death. Cheryl now writes full-time after she left an engineering career of designing and building military flight simulators in amazing countries such as England, Wales, Australia, Singapore, Taiwan, and India. Fulfilling the dream of a lifetime, she combines her love of writing with a passion for creating glass art. 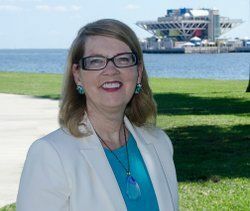 In the small glass studio behind her house in St. Petersburg, Florida, Cheryl and her husband design, create, and produce fused glass, stained glass, and painted glass artworks. Visit her online at http://cherylhollon.com, on Facebook or on Twitter @CherylHollon. When a treasure hunt leads to deadly plunder, it’s up to glass shop owner Savannah Webb and her trusty investigative posse to map out the true motives of a killer. It’s the dog days of summer in St. Petersburg, Florida, and Webb’s Glass Shop proprietor Savannah Webb has an eco-friendly plan to help locals escape the heat – a recyclable bottle-crafting workshop taught by reticent store manager Amanda Blake. Turns out, the class is a bigger smash than expected, thanks in part to a pair of staggeringly old bottles brought in by snorkeler Martin Lane. Linked to a storied pirate shipwreck, the relics definitely pique Savannah’s interest. But intrigue turns to shock when Martin’s lifeless body washes ashore the next morning, another glass artifact tucked in his dive bag. With cell phone records connecting Amanda to the drowning, Savannah must voyage through unchartered territory to exonerate her colleague and capture the twisted criminal behind Martin’s death.